The Gorillaz first new studio album in seven years finds the band, along with an unending lineup of guest collaborators, hurling huge bushels of digital bananas at the listener. 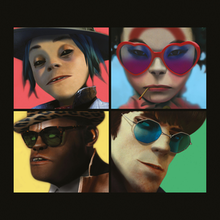 Humanz is a long playing and ultimately underwhelming release as heaps of dance laden numbers keep coming in various tweaked styles. While at the end it has been a semi-fun (if exhausting) ride, nothing jumps out as must hear. Main monkey man and Gorillaz co-founder Damon Albarn wanted the album to be an emotional response to the politically changing world all around him. There are lots of searching feelings and questioning lyrics but little in the form of political protest or statements. There are constant disco club infused beats and guests galore. Vince Staples pop’s up first delivering powerful verses on the skittering “Ascension” and the parade continues until Jehnny Beth arrives to shout out on the positive ending track “We Got The Power” in an almost Queen arena fashion (unlike anything that has come before it on the album). The moments come fast and are tweaked stylistically and in terms of success. On the positive side you find the nouveau techno soul of “Strobelite” (featuring Peven Everett) and the late night clubby cool of “Andromedia” (featuring D.R.A.M). While “Momentz” finds De La Soul back in the lyrical saddle, however pairing them with Casio keyboard sounds and cheap beats isn’t successful while Popcaan brings his dancehall reggae charm to “Saturnz Barz” but the second half from Albarn falls flat. One major takeaway is that there is a lack of big beats on the record as it sonically dives into the “taking low end away” movement lacking a bumping energy, instead moving towards club jams and slow efforts (see “Hallelujah Money” and “She’s My Collar”). “Let Me Out” is a clear song that would benefit from bombastic beats and energy but instead (even with Mavis Staples and Pusha T on-board) it remains aloof. However, this production style does help accentuate the weirdness that floats through the speakers on “Charger” (featuring Grace Jones). There is a creepy coolness boarding on industrial/serial killer sounds with buzzing guitars and eerie sonic settings. While Humanz doesn’t hit the heights Albarn and Jamie Hewlett may have been searching for, it isn’t for lack of effort. Their “party at the end of the world” effort just never really gives back the bang for the listening buck.